May be mistaken, but it does seem as if Mary Smutney and Miranda Heckman are both following Teri's Instagram, which is doubly promising given the recent conception of the account and her relatively low number of following/follower users! Mary Smutny could help on the 800 along with middle distance. Mary: "Beyond excited to announce my verbal commitment to swim and study at the University of Texas! Huge shoutout to my coach, friends, and family for helping me get here! Stoked to become a longhorn!! #hookem"
Would have been a good get, but I agree with tedbear, Cassidy has faster times than her, though her 200 & 500 times would have been a good replacement for Katie McL. "KB3" is more important. Looks like Miranda Heckman's currently making her rounds of unofficial trips ... spotted @ Spieker yesterday, I'm sure she received a very warm welcome from all our Bears! Miranda roomed with 2018 UGA commit Maddie Homovich at Junior Worlds this past summer in Indy. Wonder if any of those influences are rubbing off on her yet? Well wonder no longer, swimmer19 - Miranda paid a visit to Gabrielsen Natatorium today...i.e. the Dawgs are going after her too. Miranda: 2...4....6.... ok, let's just stop at 6. Six college tours, 4 states, in 45 days. Some of the best days and greatest memories. Thanks to everyone I've met along the way, you made this an amazing experience!! 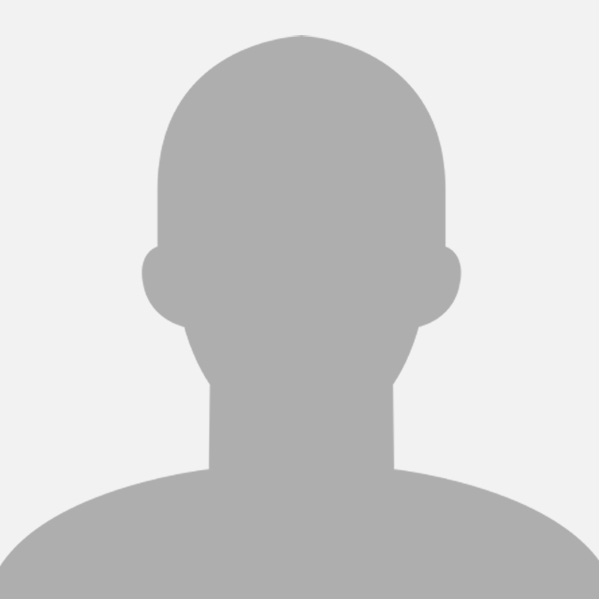 None of these recruits have known connections to Cal, but rather the Farm, Georgia, Horns, and other notable D1 programs, which may put us at a disadvantage. This is presumably one of the commits DeSorbo announced a week ago... Kate Douglass the other?? 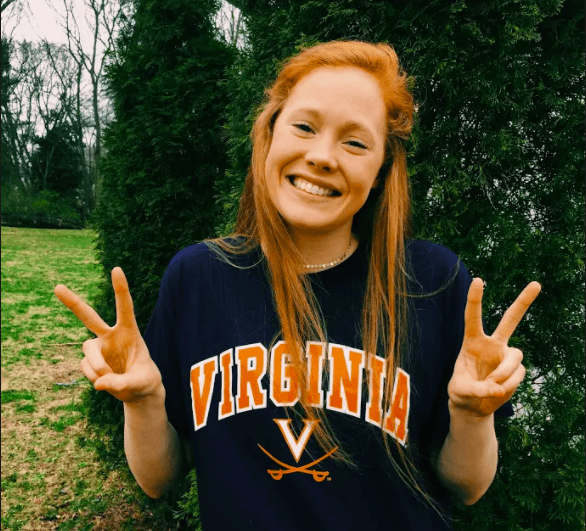 Maddie Donohoe seems to be looking at UVA, but she's not following any other swim accounts. UVA (and all their coaches), UofA, ASU, OSU, and more. She's good friends with UGA commit Dakota Luther as well as Kate Douglass, so that may affect her decision making. Well, UVA's official swim/dive account + their coaches have very exuberantly gushed on social media about an hour ago: "HUGE addition to the UVA Women's Swimming family tonight! #add #2019 #virginia"! Cavaliers/Wahoos already looking to be a fast-rising programme ever since Todd replaced Augie, making considerable inroads in their recruiting right from the get-go. My gut feeling is that the HUGE addition has to be someone who can give their team a massive boost straightaway, in which case the first name that leapt immediately to mind was Kate Douglass. Sounds like a great pairing - Hoos are really building up a very deep corps of freestyle talent (that's how the UVa women primarily managed to upset all the predictions by so-called experts, with their 233 margin of victory over ACC favourite Louisville - racking up 165 pts in the 200 Free with an impressive 2-3-4-5-8-9-10 finish, 123 pts in the 100 Free, & 125.5 pts in the 50 Free! 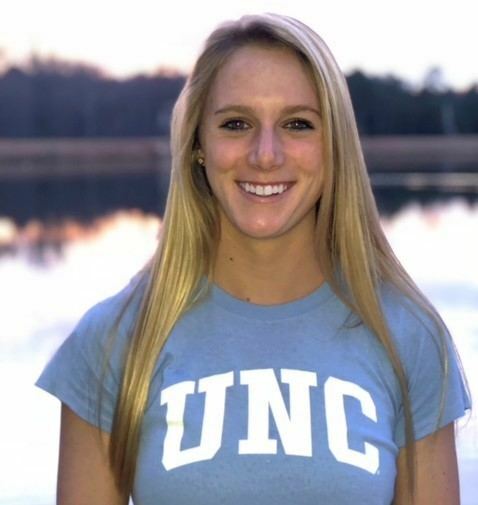 ), so the best distance recruit of the class will complement all the sprinters there, has Leah Smith's records to aim for, and gets to stay in state to boot. Agree that Kate Douglass could be the next big(ger) recruit to announce there. 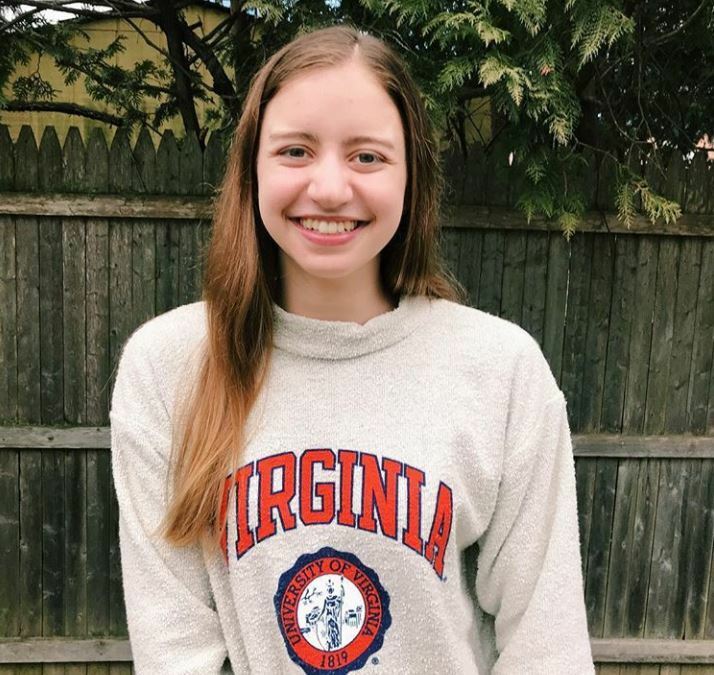 UVA seems a logical destination enough for KD - academics, sprint free reputation, swim programme on the rise with their new, dynamic coaches, not to mention that Kate has already made a trip there recently, her family appears to have a lot of interest in the Wahoos, and she's good friends w/Maddie & the Donohoes. 10. Kaitlyn Dobler (2020): bearz012 pointed her out to me. Kaitlyn looks like a great 2020 recruit: #1 OR, #9 Nat. Primarily a breaststroker (1:00.5/2:11.4), has a more than decent 50 free (22.8). Keeks is partially from Oregon, so that's the only connection I know of. We may not be in need of more breaststrokers by then, but she also has a high improvement curve (all best times done quite recently). Aloha's Kaitlyn Dobler set a state record in the 50 freestyle with a 22.35. Dobler then crushed the 100 breaststroke. The sophomore clocked a 59.89 to set a state record. Another instate prospect to look for is Riley Lexvold (#43 Nat #6 CA), who is another versatile swimmer, albeit not at the same caliber as Izzy or Chloe, but a valuable swimmer nonetheless. She swims for Mission Viejo (Katie McL) Most of her times were done quite recently at Winter Juniors, and her IM time is a sub 2:00. She's following Cal, Purdue, Ohio State, ASU, Stanford, Arizona, Virginia, Georgia, Oregon State, USC and Northwestern. Her freestyle progression is quite good, as she's dropped 4 seconds in half a year. Oof - just as I posted that, I found this...she's an $C lean. Riley: "I'm beyond excited to announce my verbal commitment to further pursue my academic and athletic career at Arizona State University! Thank you to my family, friends, and coaches, who have all helped me get to this point. I can't wait to be apart of the Devil family! 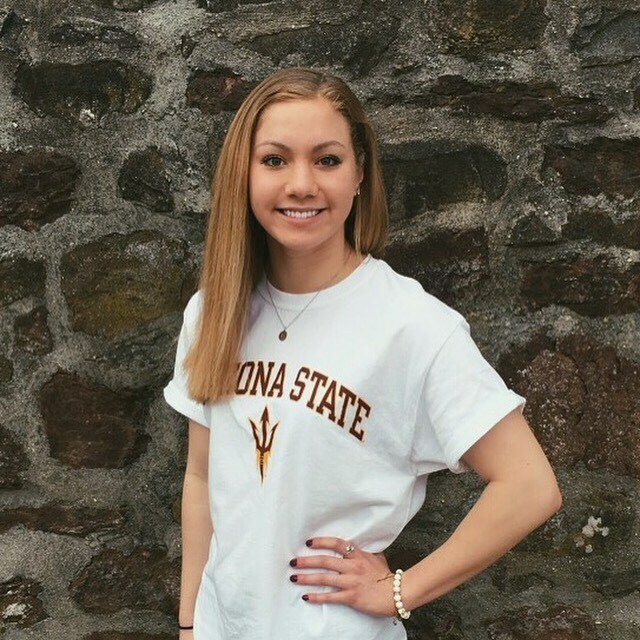 #forkem #ladydevs"
Claire: "I am so excited to announce my verbal commitment to swim for Arizona State University! Thank you to all my friends, family, teammates, and especially Coach John Flanagan and my high school coach, Joel Getis for all of their support over the years. I am so grateful for the opportunity to go to school and swim at Arizona State, and I cannot wait to become a part of such an amazing team. Go Sun Devils!" 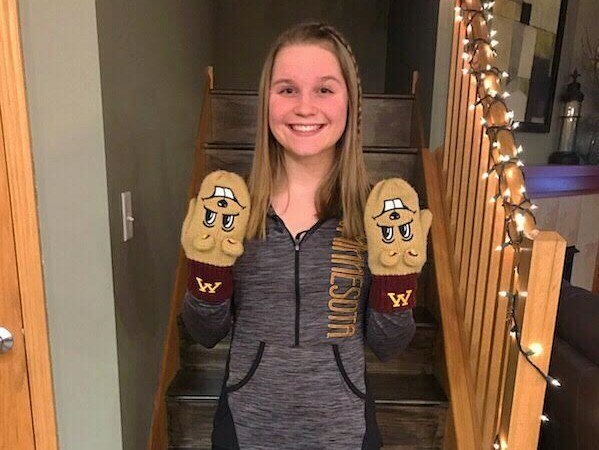 Emma: "Very excited to announce my verbal commitment to the University of Minnesota and beyond excited to continue my education and swimming career there in 2019! #futuregopher"
Amy: "I am ecstatic for the opportunity study at one of the top universities in the country and to train under Coach DeSelm. The unique thing about Carolina is the staff and team recruited me not only as a swimmer, but as a person. They all value the Carolina culture and I can not wait to be a part of it." C'mon, DeSorbo & co. please stop teasing us and just announce the identities of these 2019 "game over" verbals already, won't you? One of 4 (?) verbals they have on the women's side, the other one being officially announced Madelyn Donohoe. Pretty dang convinced Kate Douglass is another one; the last one being *maybe* Olwyn Bartis/Madelyn Flickinger?? Ella is club teammates with the Walsh siblings; wouldn't be too surprised to see them considering there in the near future (hopefully not). Ella: "WAHOOWA!!!!! BEYOND excited to announce my verbal commitment to continue my swimming and academic career at UVA! SO thankful for everyone who has supported me along the way. Can't wait to be a part of such an exciting team #gohoos"
Definitely a huge recruit for the Hoo's. I sort of saw this coming, as on Maddie's commitment post, she commented a "congrats", which was liked by Todd & C.O. A&M would have been a good fit in their IM and breast group. 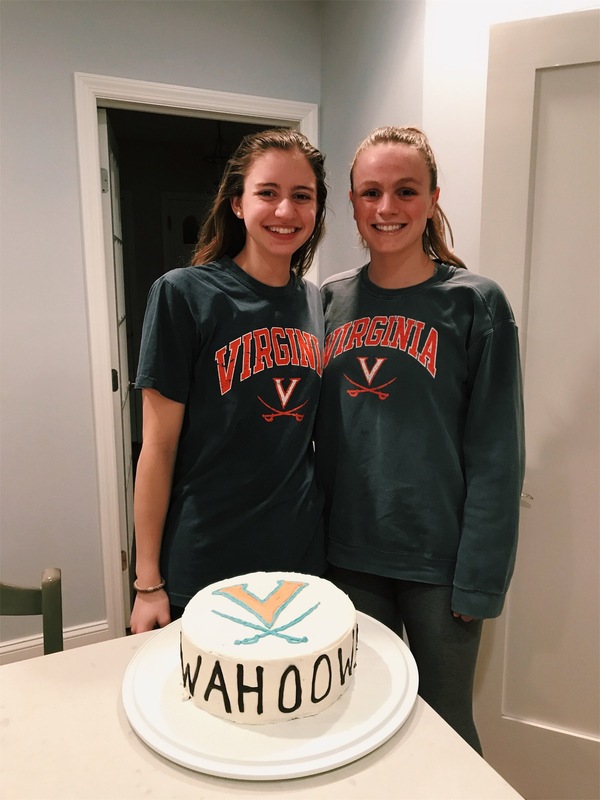 Let's see if this influences the Walsh sisters (as she is closer with them than the Raab sisters were) A class of Maddie Donohoe, Ella Nelson, Kate Douglass & Olwyn Bartis would be huge for UVA, probably the best since their class of 2017 (Leah Smith, Kaitlyn Jones, Ellen Thomas, Laura Simon), and this is only Desorbo's 2nd recruiting class at UVA. Given the rate of the DeSorbo effect, there's been 4 announced recruits, two of whom are anonymous. Looks like both of KD's parents are being followed by the official UVA acc on insta as well, thus only cementing our conclusion that one of the remaining two anonymous recruits is KD. Which of our other potential recruits could fall under the trap and head to C'ville? I'm thinking Zoie Hartman and Kelly Pash. Olwyn Bartis/Maddy Flickinger/Cora Dupre a possibility. I know we are recruiting Zoie hard, and for that matter, probably Kelly as well. Not sure of our status with the remaining three, but as far as I'm concerned, UVA recruiting could possibly top Stanford recruiting this graduating class (2019). Some other 2019 recruits UVA has developed a potential interest across (which is quite a few): Caroline Kulp/Whittney Hamilton (VA Gators), Ashley McCauley (Marlins of Raleigh), Alex Crisera (SoCal), Emma Wheal/Stephenson, Ella Collins (Austin), Natalie Whalen (North Texas), Kaitlynn Sims (Magnolia), Coleen Gillilan (FAST Fort Collins), Gillian Davey (Central Iowa), Lindsay Looney (Metro), Ashlyn Fiorilli (Texas Ford), Kat Berkoff (Missoula). We've discussed most of these recruits in some capacity or another. They're also formulating relationships with notable swim clubs: Irvine Novaquatics, SwimAtlanta, Sandpipers of Nevada, and Carmel. As for internationals heading to C'ville, Faith Knelson is another Wahoo target. I'm guessing the remaining two recruits are Olwyn Bartis and Kate Douglass, based on which comments of congratulations that Desorbo & the UVA coaches liked. Another possibility is Ashlyn Fiorilli. On the men's side, they're recruiting Brendan Burns and open water swimmer Ivan Puskovitch. I'm pretty sure in my prediction that Kelly Pash --> Texas, honestly. Okay, so now that our crown jewel is in the fold, I wanted to state my case for our second most important recruit in the class of 2019. Sorry, bearz012 and swimmer19, it's not Zoie Hartman. Now what we need to consider is that we are losing two of the greatest backstrokers in the nation and in the history of Backstroke U in the form of Kathleen and Amy. Finding a replacement for these two is not only important for our backstroke scoring, but also for our medley relays. For that reason, I think Katharine Berkoff should be the next big recruiting target in the Class of 2019. So let me demonstrate my Berkeley education and analyze the numbers. So the first thing that jumps off the page is that Kathleen and Billy are head and shoulders above everyone else. We knew that they were talented when they were recruited and they have definitely lived up to the hype. Billy would probably be the best backstroker on every team in the country, except for here. We can possibly argue that they might be the two best backstroke recruits over the past four years. The current backstrokers on the team are a step below. Our current best option after the aforementioned two, is Keeks and she is a second behind on the on the 50, two seconds behind on the 100, and a whopping four seconds behind on the 200. This brings me to Katharine Berkoff, or as UAC likes to say, the third killer KB. She is the only one who has numbers that are close to Kathleen and Amy, and after time training with Teri, I expect those times to drop considerably. Now, I think Katharine needs a third event, but even if she only does the 100 and 200 Back, and both medleys, she is still so elite at what she does that it outweighs the need for a third event. I'll let someone else crunch the numbers for Zoie compared to Ali and Ema, to see if my argument holds water. Bears are in excellent relay shape for 2019. Only lose Nono from Teri's preferred relays. Can replace her with McL, Maddie, Cassidy, or Elise, so Bears don't need to add another flyer for awhile. As an aside, need to offer serious props to McL. Was the first Dream Teamer to commit and at the time was thought to be a flyer with some free chops. Injury set her back, but she can swim anything needed in free from 50 to 500 and both flys. Great teammate and Golden Bear. Thleen, Amy, and McL will be impossible to replicate, but some of the pieces are already partially in place (Maddie, Keeks, Robin, Sarah) or in the pipeline (Izzy, Cassidy, Elise). Maddie and Ali contributed a lot earlier than expected, so ironically focus needs to be on back. Keeks and Izzy have upside and a mystery international could emerge, but KB3 should be the main recruiting focus. 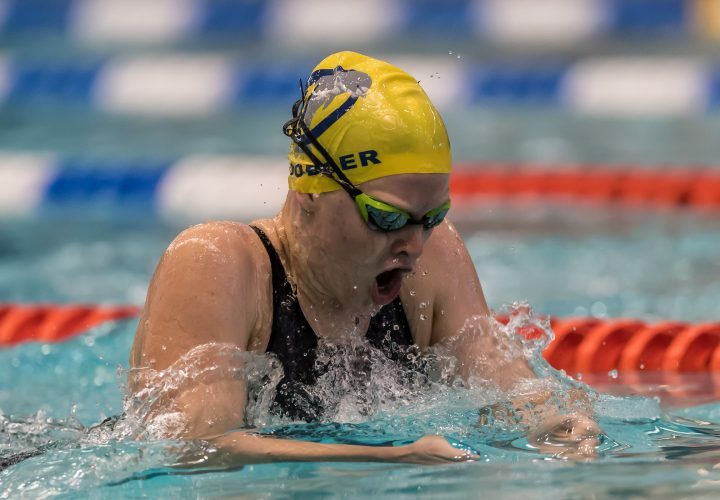 A distance swimmer who could also swim an 800 Free Relay leg or another breaststroker could also help, but a stud backstroker is the most pressing remaining need. Kate: "So excited to announce my verbal commitment to swim for the University of Virginia!! Go Hoos! One of the top sprinter freestylers in the nation, she owns the 15-16 National Age Group Record in the 50 yard free (22.04, tied with Simone Manuel). Douglass is also a superb breaststroker; she was runner-up in the 50 free and placed third in the 100 breast, 4th in the 200 IM and 8th in the 200 breast at 2017 Winter Juniors East. She also competed in the 100 free, in which she won the C final with the 4th-fastest time in the meet (49.10) and the 100 fly. Douglass won the 100 free and was runner-up in the 50 as a freshman at the New York Public School high school championship. The following year she won both events, setting NY state records in the process. She represented Team USA at 2017 FINA Junior World Championships, earning a silver medal as part of the women's 4x100m freestyle relay. Douglass' best times would already have impacted UVA's results at the ACC Championships. She would have scored in the A finals of the 50 free, 100 breast and 200 breast, the B final of the 200y IM, and the C finals of the 100 free and 200 free. Less of a comment on Kate's commitment than the hype from UVa and Desorbo ... "Game over" in their tweet a tad dramatic, in my opinion. I'm all for coaches, teammates, and universities being excited for their incoming recruits and commitments, but where is a semblance of modesty (or reality, if that's not being too harsh!) ? +1 Most likely getting ideas from the moron! Lexi: "Super excited to announce my verbal commitment to swim at UVA!! I'm so thankful for the support of my family, coaches, and friends in getting me here and I can't wait to be a cavalier #wahoowa"
Was surprised it wasn't Bartis, but I guess Desorbo is going for all the VA recruits. Based on his record with sprinters thus far, I wouldn't be surprised to see if Katie Mack (NCAP, #28 Nat, #3 VA) also ends up there. 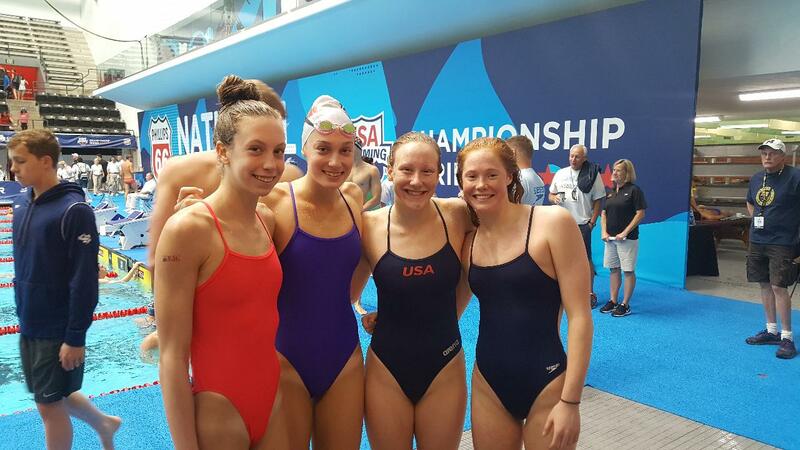 There are lots of great VA swimmers in the 2020 class, esp. Olivia Bray. Smaller meet in terms of popularity, but the American Short Course Champs are taking place at the Texas Swim Center in ATX this weekend. The American Short Course Championship, which functions as a combination college last chance meet and big age group invite meet, definitely was geared more toward the latter description on the first day of this year's meet with, high school swimmers taking five of the six individual events, although the sixth event may have made the difference in securing an NCAA invite. The night opened with the girls of the Carmel Swim Club taking the women's 200 free relay with a time of 1:33.69, highlighted by a 22.76 leadoff swim by Kelly Pash (2019). The 16-year-old, who swam for Team USA at this past summer's World Junior Championships, was the individual star on the women's side. After that leadoff split, she proceeded to win the women's 500 free with a time of 4:44.80, and then she jumped back in the pool not much later to swim a 1:58.48 in the 200 IM and earn the win in that event as well. Austin Swim Club's Quinn Schadler (2020) won the 50 free with a 22.98, and then the Kamehameha Swim Club took the 400 medley relay in 3:53.31, just beating the Gulliver Swim Club. On the men's side, the team from the University of Wisconsin finished just ahead of the team from Texas A&M, 1:19.43 to 1:19.80. Wisconsin featured the same four men who swam the event at the Big Ten championships, but they were still over a second off of their time of 1:18.25 from last week, which fell under the NCAA B cut, but not the A cut. Indiana commit Michael Brinegar took the men's 500 in 4:19.30, a new personal best time for him. Matthew Willenbring, another Team USA representative at the World Junior Championships, knocked over two seconds off his prelims time to win the 200 IM in 1:44.14. He was swimming in what will be his home pool next year, as he's a Texas commit. That 1:44 is a fast time for any high school senior, but especially for one who's roughly 6'11 and anchored the USA's medley relay in a sub-49 second swim last year at those World Junior Championships. Willenbring tried going for the 200 IM/50 free double, but neither he nor future Longhorn teammate Drew Kibler could pull out the win. Instead, that went to Yale's Aaron Greenberg, who won in 19.34. His previous season-best time was a 19.36, but that 0.02s drop looks like it might've made the difference in securing an NCAA invite, even taking into account the times from tonight's Pac-12 championships. Finally, Texas A&M won the 400 medley relay in 3:10.80. Pic below is at the Graffiti Park at Castle Hill in Austin, not far from the UT campus. Hey you lot need to get your act together, you missed this one lol!! Hosted by the Nashville Aquatic Club (NAC), the meet runs from Friday, March 2, through Sunday, March 4, at the Tracy Caulkins Competition Pool at Centennial Sportsplex in Nashville, Tennessee. Twenty-two teams from nine states will be represented, with most hailing from Georgia, Kentucky, and Tennessee. There are many swimmers gaining national recruiting attention that will be racing in Nashville. Two swimmers on the girls side to keep an eye on are Gretchen and Alex Walsh. Both Nashville swimmers currently hold national age group records. Although not in the age group anymore, Gretchen Walsh holds the 13-14 50 freestyle record with a 22.00, a time that is her seed for this meet. That time is also faster than the current 15-16 record of a 22.04 held by Kate Douglass and Simone Manuel. Walsh is also just a second off of the record in the 100 freestyle. Alex Walsh holds three national records. She owns the top marks in the 200 individual medley for both the 13-14 and 15-16 age groups as well as the 100 breaststroke for 15-16. She is closing in on multiple other national records. This weekend she will have a shot at breaking four additional records. Alex Walsh is 0.24 of a second from the top 50 freestyle mark and 0.15 from the 100 backstroke. She is around a second off the 200 backstroke and breaststroke records. Future Stanford Cardinal Allie Raab, competing in a home meet, is highly seeded in the 200 freestyle, 200 IM, and 400 IM. She ranks in the top 25 of this year's class. Raab will battle Nashville teammates Ella Nelson and Alex Walsh in the IM events. Those two are also at the top of their respective classes. -Emma Sticklen (2020, Katy Aquatic Club, Katy, TX): Primarily fly/free (sprinter), with a strong 100 back. Also big short course swimmer. She broke Cammile Adam's pool record (100 fly) at high school regionals last year as a freshie, if that isn't indicative of her talent. Also an NISCA All-American, UIL (basically TX's CIF) Academic All-State, and finaled in every single event she swam at 2017 Winter Juniors minus 100 free (2nd alternate). Huge improvement curve as well. I have attached a pic of her and Emma Stephenson, 2019 TX recruit, both are also friends with Emma Carlton (2018 TAMU Commit). I work with the UIL specifically with her school district, which explains my in-depth-ness on her. 1. 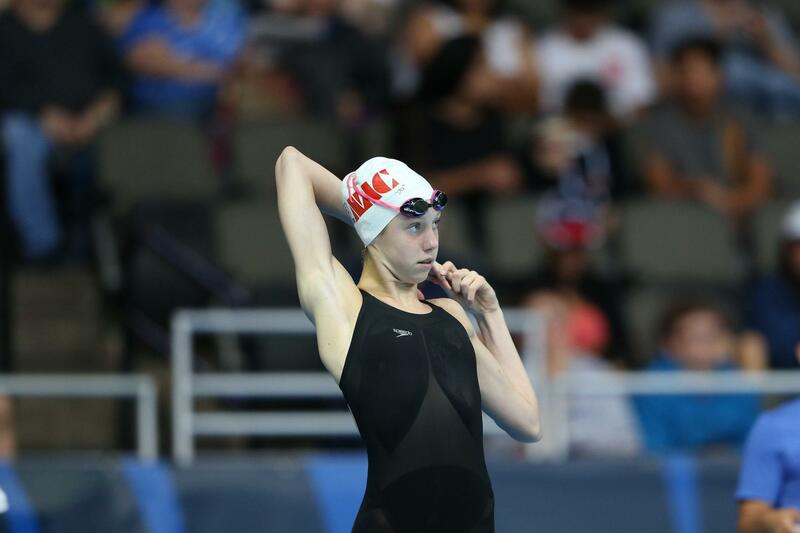 Emma Sticklen (Katy Aquatics): I'm putting her as another must-get for 2020 behind Alex Walsh. She broke her pool AND region record TWICE this weekend (prelims/finals), once in a practice suit. She's seeded #1 in the 100 fly, and a respectable #3 in the 100 back. 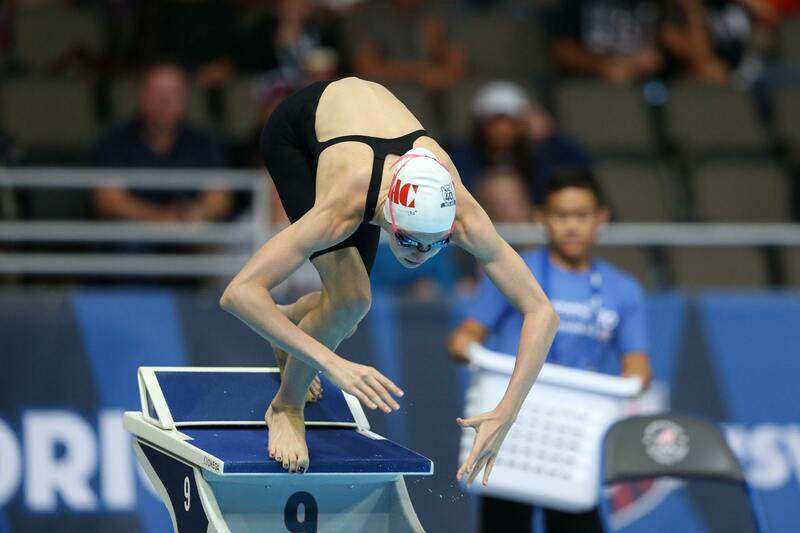 Katy Aquatics 15-year old Emma Sticklen had an equally-significant 200 fly at the same age, winning the women's race in 1:54.88. That's a new lifetime best by 3.01 seconds for her. Like Urlando's swim, that's the fastest time this season, and ranks 3rd all-time among 15-year olds. Katy Aquatic's Emma Sticklen dropped three seconds from her entry time to win the women's 200 fly in 1:54.88. DART Swimming's Halladay Kinsey was second in 1:57.16 and her teammate Amalie Fackenthal took third in 1:57.43. For some perspective, that 1:54.88 from Emma would currently rank #18 in the NCAA, just behind furdette Lindsey Engel's 1:54.78 from 2018 Pac-12s! Also would have been good for 8th in the A final of our conference champs from last week! The first day of one of the most exciting non-championship junior meets in the country saw the Walsh sisters pick up right where they left off in their first meet since the Tennessee High School state championship a month ago, and first club since they dominated Winter Juniors in December. 15-year old Gretchen Walsh won the 200 free in a new lifetime best of 1:45.88. That knocked 2 full seconds off her previous flat-start best, which was set at this same meet last year. It was also faster than the 1:46.1 that she swam on a relay start at Winter Juniors East. She won that race by 2-and-a-half seconds, and in the process kicked off a near-clean-sweep for the Nashville Aquatic Club of the day's girls' "open age" events. They won the 200 free relay in 1:30.91, with Gretchen leading off in 22.61 and older sister Alex Walsh anchoring in 22.06. Alex Walsh won her first event in the girls' 200 back with a 1:52.47, taking a 5-second margin of victory over Lakeside's Annabel Crush. Incidentally that 1:52.47 is the 3rd fastest 200 Back ever done by Alex. Big Walsh has a 1:52.07 to her name from 2015 Winter Juniors, with her PB of 1:51.42 achieved @ 2017 Winter Jrs,, which may constitute her SCY taper meets. This just in - @ tonight's session (still in progress), Alex busted out a very nice 24.39 leading off NAC's 200 MR. Her PR in the 50 Back is a 24.17 from 2017 Winter Jrs. Even more impressive was mini-Walsh laying down a scorching 21.44 on the anchor leg of their medley relay! Unfortunately for Gretchen & Alex, their commanding performances couldn't quite lift the team to victory with their 1:39.37 final time (2018 furdette Allie's breast split = 28.11, NAC's fly leg = 25.43), as Cardinal Aquatics of KY took the win in 1:38.67 thanks to their middle legs (27.41 Br, 24.06 Fly). Wow, Walsh sisters just keep slaying ... big PBs for Gretchen (21.85!) & Alex (22.08) in the 50 Free, as they take down their former lifetime bests of 22.00 & 22.28 respectively from 2017 Winter Juniors!!! Gretchen's time is just off this year's NCAA "A" standard, and would rank #11 in the NCAA currently, ahead of Mallory Comerford & Janet Hu! Gretchen broke another PR soon after, scoring a 1:59.62 to end up 4th in the 200 IM, with Alex easily winning the event in 1:56.14 over Ella Nelson's 1:58.53. We've have had Alex on our collective radar as a prospective Bear for the longest time ... here Gretchen's making some slick moves to become an even higher priority recruiting get a year after her sis! Alex won the 100 Back in 51.71 ... almost 2 sec ahead of runner-up Annabel Crush. Walsh major's PB = 51.45 from 2017 Winter Juniors. Meanwhile Walsh minor breaking another PB with a stunning 47.93 to claim the 100 Free over teammate & future sapling Allie Raab's 49.61! Gretchen's prev lifetime best was a 48.72, also from 2017 WInter Jrs. Meet is still in progress, the above results was taken from Meet Mobile, so I may have missed something. UPDATE => Not to be outdone by mini-Walsh, Alex firing back with a massive PB of her own - an astonishing 2:06.45 in her 200 Breast (former best = 2:08.85 from the 2017 edition of this meet), ahead of UVA commit Ella Nelson's 2:09.81 (also a PB) & Claire Donan's 2:13.64!!! Nicely takes down 2018 furdette Zoe Bartel's NAG (2:07.73). That is a 2018 NCAA 'A' cut, would currently place Alex 4th in Division I (behind only Sydney Pickrem, Lilly & Anna Belousova). Would also have been good for 7th in the A final of last year's NCAAs, and 2nd fastest ever in Cal's history books (behind only Caitlin Leverenz) if Alex was a Bear today! UPDATE => Well, Gretchen answered just now with another PR of her own - 52.81 in the 100 Fly (old record = 53.07 from Winter Jrs). Miranda Heckman: It is with great pride and excitement, that I have the privilege of announcing my verbal commitment to swim for the University of Texas Class of 2023. I chose the Longhorns because of the outstanding coaching staff, the amazing facilities, and my instant bond with the team. I believe they will help me achieve the success I strive for both academically and athletically. I would like to thank my family, friends, and coaches for supporting me throughout this process. Hook 'em! Disappointing most with Miranda from our own backyard! Bears are still in fine shape with #1 Izzy & #21 Chloe!